Back in 2015 I released a Kingdom Hearts Winnie the Pooh book paper toy with the intent of producing a series of paper toy books. Here finally, is the second book in the series: the Enchiridion from the Adventure Time animated television show! This is my release of original papercraft for the month of December as promised in November. 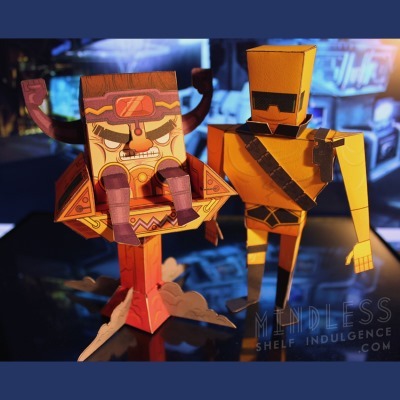 The papercraft template for the book may be downloaded here. Inside the book is a map of the Land of Ooo where the Adventure Time stories take place. 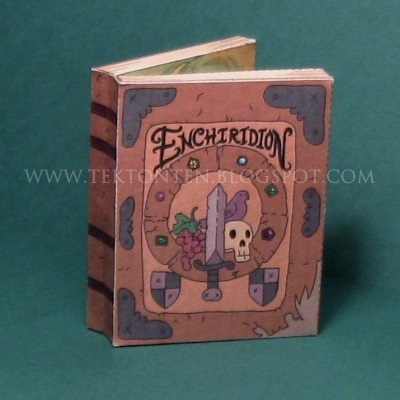 The Enchiridion is a powerful ancient tome found by Finn the Human on one of his adventures. Several years ago Canon Creative Park released a Santa Claus papercraft set complete with sleigh, Christmas presents, and a reindeer. 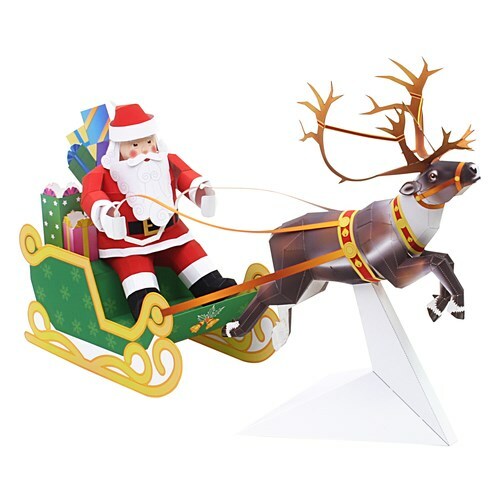 Recently, Canon released a new mini version of the papercraft where the reindeer is flying instead of walking like in the previous, larger version. 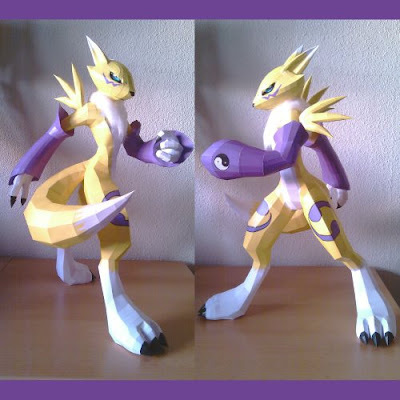 This papercraft was created by Katsuyuki Shiga and may be downloaded here. Robert Nava at The Disney Experience has done a lovely job of scanning and cleaning up a vintage Peter Pan "punchout book". The 1953 book features glue-less construction and includes four dioramas of scenes from Disney's Peter Pan (my fave is the mermaid scene ^^ ). 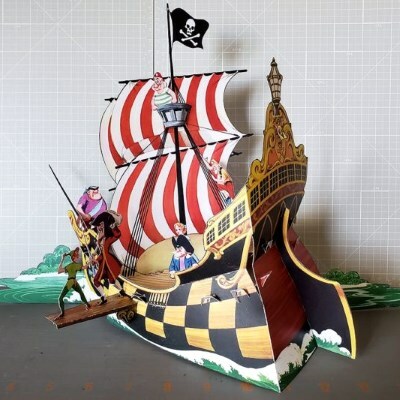 Pictured is the largest of the dioramas: Captain Hook's pirate ship. The printable PDF for the dioramas may be downloaded here. "The niffler is a British beast. Fluffy, black and long-snouted, this burrowing creature has a predilection for anything glittery. Nifflers are often kept by goblins to burrow deep into the earth for treasure. Though the niffler is gentle and even affectionate, it can be destructive to belongings and should never be kept in a house." 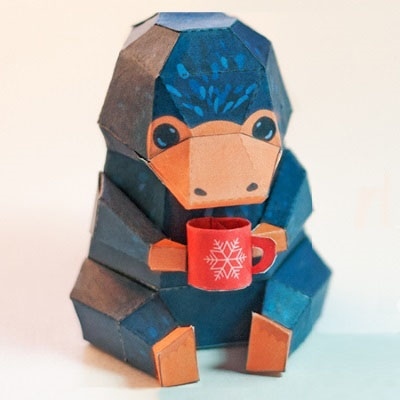 This cute paper toy version of a niffler was created by Annie and maybe downloaded at her website Tiny Craft World. Keep up the good work Annie! 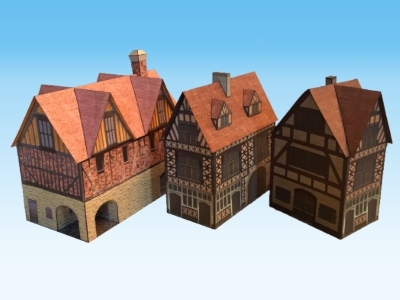 These papercraft European-style medieval buildings were created by a member of Cardboard Warriors, a forum dedicated to paper miniatures war-gaming. Although intended for miniature gaming, I think they would also work well as part of a Christmas village. Pictured are a guild hall, an inn yard entry building, and the "White Hart Inn". The PDF templates for the models may be downloaded here. 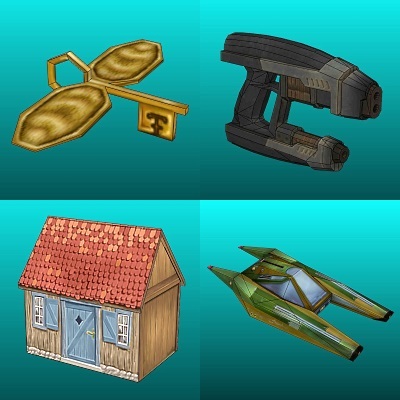 Included in the download are cut files that may be used with a Silhouette Studio electronic cutting machine. Día de Muertos (The Day of the Dead) is nearly upon us. This year it begins on October 31, the same day as Halloween, and runs through November 2. Día de Muertos is a time when Mexican families remember loved ones who are no longer living. 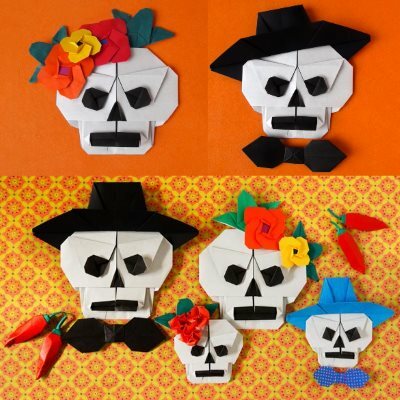 These origami skulls were created by Origami Spirit for use as Day of the Dead decorations. Links to separate video instructions for each of the pieces in the photo (skulls, flowers, hats, bow ties, and peppers) may be found here. 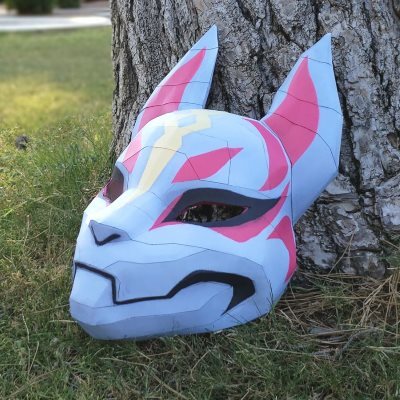 It is nearing Halloween and every good papercraft blog is posting masks for the season. 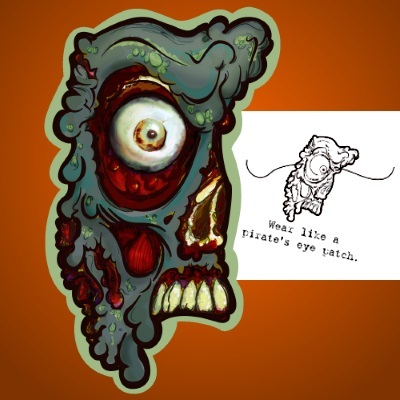 Here is one from me: a zombie half mask! I thought covering only one eye was an interesting idea for a mask. 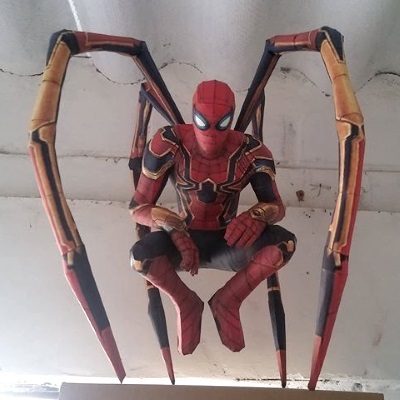 Although in order to make this look right I think the nose area of the mask needs to be cut out to allow your own nose to stick through. 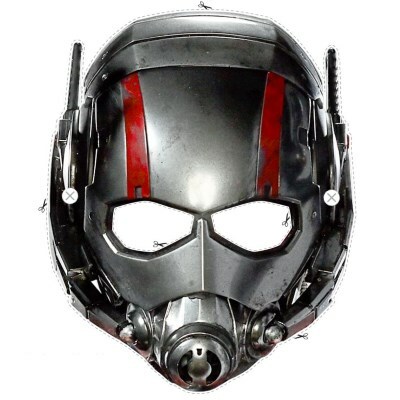 ^^ The 2D printable image for this mask was created by Buz Carter and may be downloaded from his Flickr page here. "It's like a massive upsurge of energy. Everything is heightened: power, speed, even hearing and vision improve dramatically. You sort of become a super-self. But it can only be sustained for a short time, so you have to get the job done quickly." Akita dogs come in two varieties: American and Japanese. 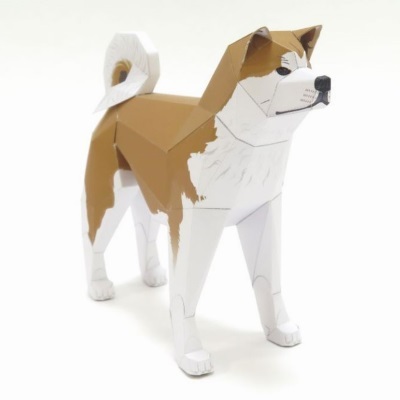 This papercraft Akita depicts the Japanese variety which is called "Akita-inu". Akita-inus were originally bred in the north of Japan for use as hunting dogs. 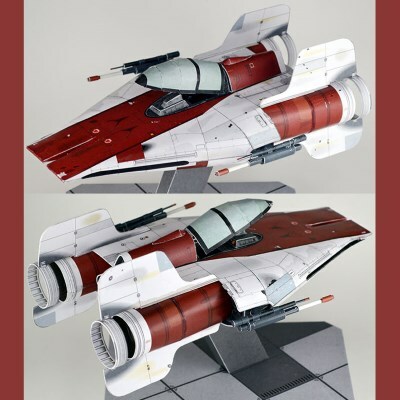 The template and instructions for this paper model are available from the Akita Prefecture website. 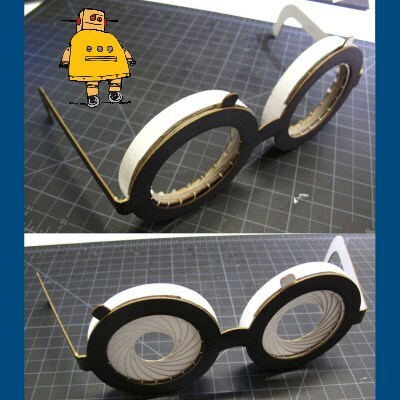 I really like these functional papercraft iris glasses. I think they would make a good prop as part of a steampunk Halloween costume. Instructions and templates for the glasses may be found at the Instructables website. Iris mechanisms like this have been used in cameras for over a century. 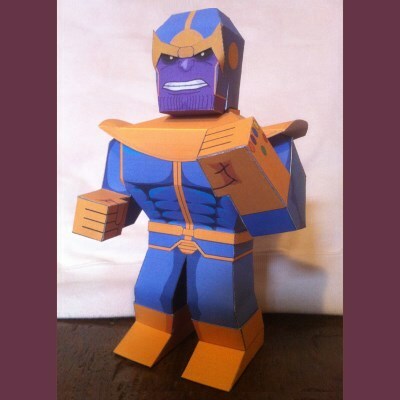 The wait for some decent Infinity War papercraft is over! 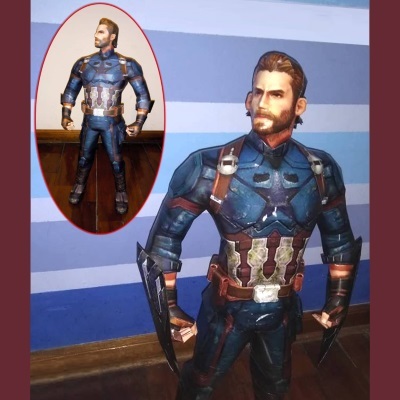 This Captain America paper model by Zav-Papercraft comes complete with removable Wakandan shields. 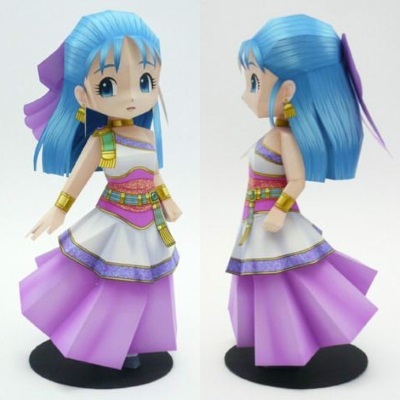 PDF and Pepakura PDO templates for the model may be downloaded here. 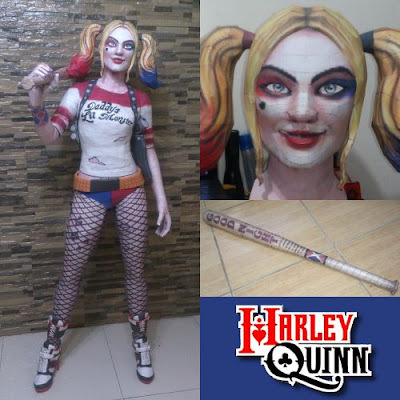 The finished model is 19.7" (50 cm) tall. The next Avengers movie is currently scheduled for release in the US in May 2019. I can hardly wait! 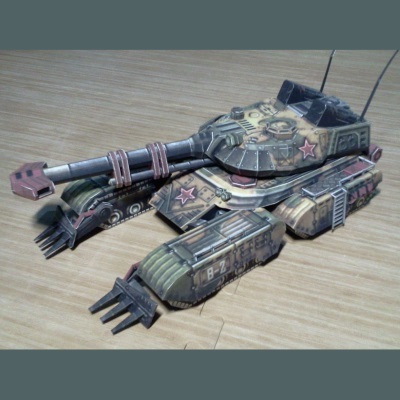 This paper model Sentinel tank is based on a 3D model from the Rise of the Reds mod for the Command and Conquer: Generals - Zero Hour video game. If you couldn't tell by the red stars, this tank is used by the Russian army in the game. 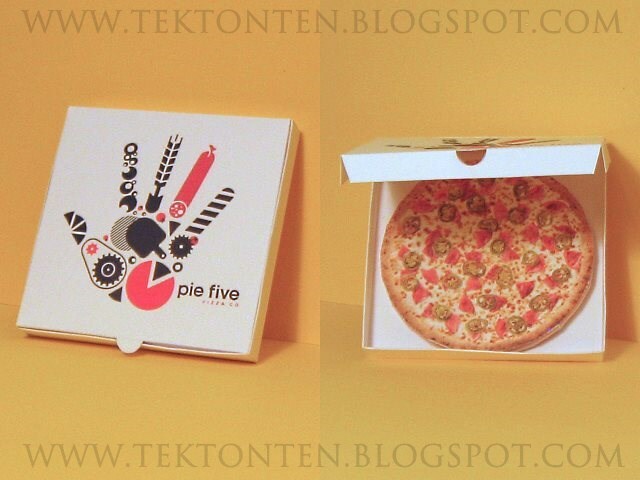 The papercraft template for this model was created by DeviantART member n5p29 and may be downloaded here. 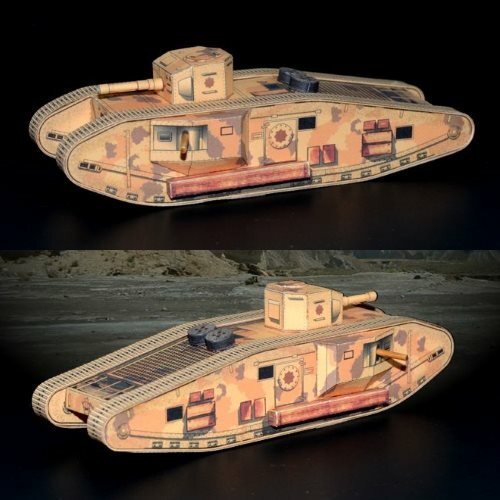 Several upgrade parts are available for the tank. Since its release in 1988, the science fiction anime movie Akira has achieved "cult classic" status. Set in the year 2019, the movie follows the exploits of a Japanese biker gang led by Shōtarō Kaneda. Keneda's motorcycle is a red high-tech racing bike. The distinctive bike has become an icon for the film. 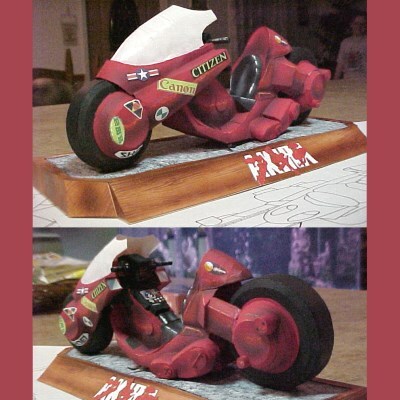 This paper model of Keneda's bike was designed by Brad Tate. 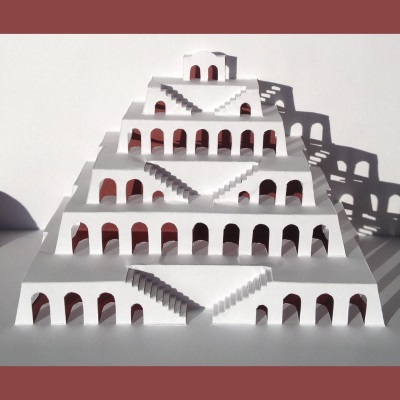 A free download of the PDF template for the papercraft is available here. Visual assembly instructions are included in the download. The Akira motorcycle was recently featured in the movie Ready Player One. 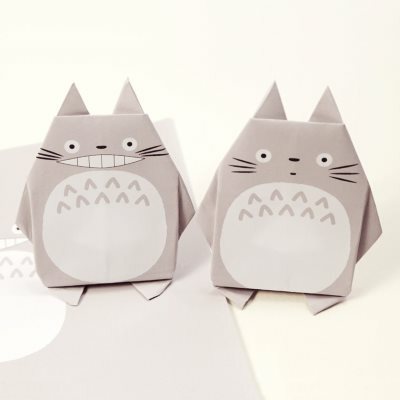 I hate to use the term "printable origami" but that is pretty much what these origami Totoros are. Instead of using a pre-colored square of paper like is done in traditional origami, a square is printed from a PDF file. Graphics for the Totoro's face and belly are positioned on the square so they end up in the right place after the folding is complete. The templates for these Totoros were created by Paper Kawaii and maybe downloaded here. Totoros are one of the many characters to be found in the animated movies produced by the Japanese company, Studio Ghibli. Inside the virtual reality game in Ready Player One, the hero of the movie, Wade Watts, drives a DeLorean like the one seen in the movie Back to the Future. However, Watts' car has some additional modifications. First, the car has been equipped with the on-board computer and red scanner of the Pontiac Firebird from the Knight Rider television show. Second, the car's license plate reads "ECTO-88", a homage to the Ghostbusters ambulance which has the license plate "ECTO 1". 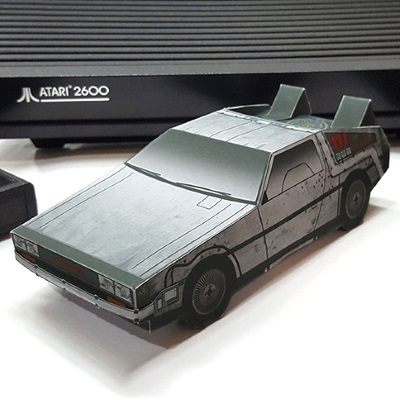 This papercraft model of the DeLorean was created by Paperized Crafts. The printable template for the model may be downloaded here. Suicune is a Legendary Pokemon that was introduced in the series of Generation II Pokemon video games released for Game Boy Color in 2001. Suicune is featured on the box of Pokemon Crystal Version. 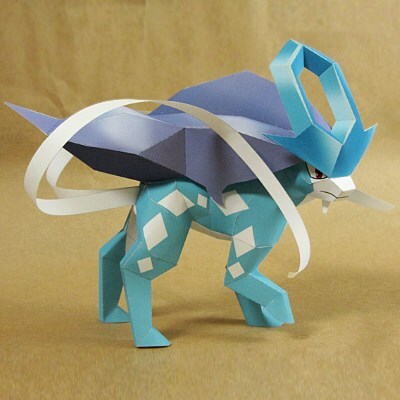 This papercraft Suicune is one of the many excellent Pokemon models available from Tenpepakura. A PDF template for the model may be downloaded here. As you might guess by its blue color, Suicune is a water-type Pokemon. This printable Harry Potter Monopoly board is not a scan of the store bought version of the game. It is a work of fan art produced by a Harry Potter blog in the Netherlands. 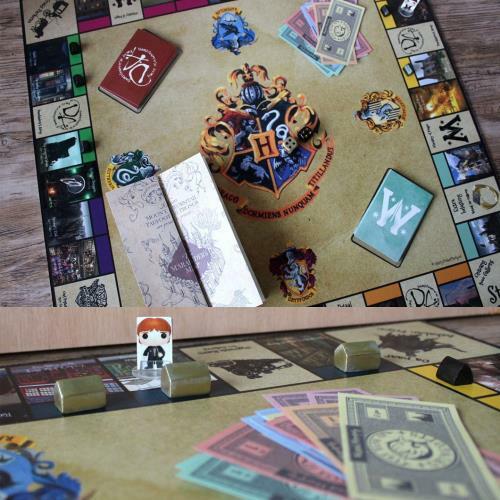 Except for the houses and hotels, everything you need to play is included. I like that the instruction book for the game is made to look like a Marauder's Map. 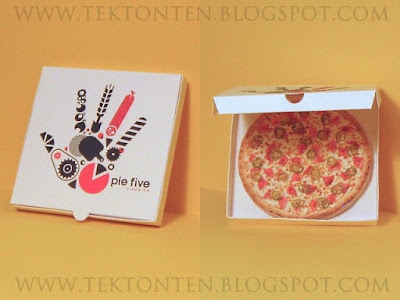 :) The game is available in both Dutch and English language versions. The PDF templates for the game may be downloaded here. During World War II, the US military used Willys MB Jeeps while the German army used Type 82 Kübelwagens. Kübelwagens were designed and built by Volkswagen at the request of the Third Reich. 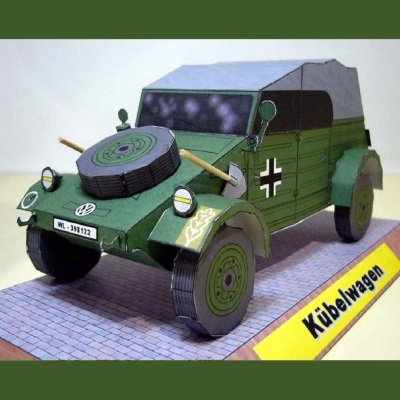 This 1:17 scale paper model of a Kübelwagen was created by Toni Mauricio. The PDF template for the model may be downloaded here. In the US in the 1960's, Volkswagen introduced a version of the Kübelwagen known as the "Thing". I heard a rumor that in the near future a new Maplestory app is going to be released. It made me nostalgic. 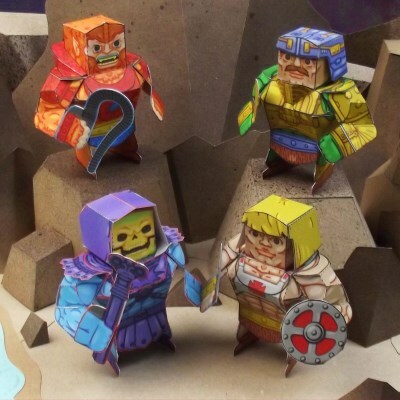 Ten years ago Maplestory papercraft was some of the best fan art papercraft you could find. 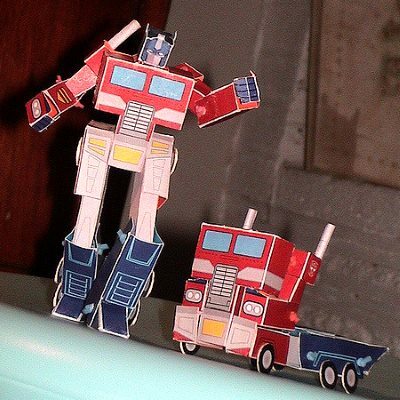 I managed to track down one of the old paper models. 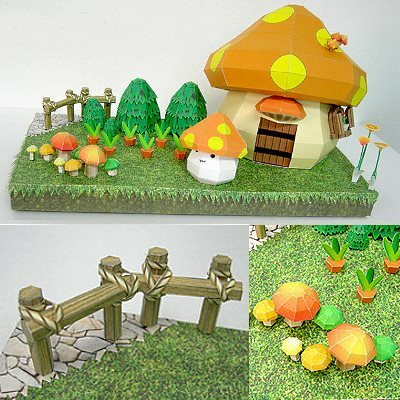 It depicts the character "Mushmom" in front of her mushroom house. 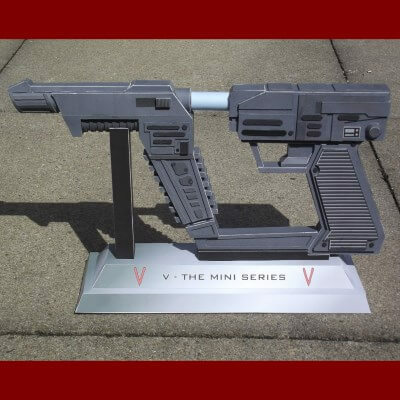 A download of the printable template for the model is available here. Maplestory is a free Korean MMO video game that was first released in 2003. The full title of this vintage paper theater is "Pollock's Britannia Theatre with the Characters and Scenes for Ali Baba and the Forty Thieves." 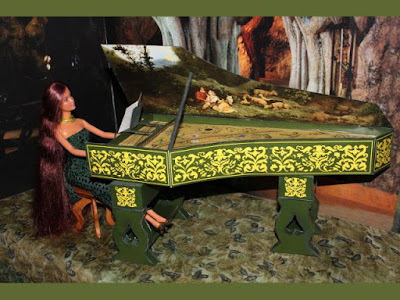 The set includes fourteen characters and several backdrops. The printable template for the theater is available from Agence Eureka. Build photo by Maggie. The tale of Ali Baba comes from a collection of Middle Eastern folk stories known as One Thousand and One Nights. 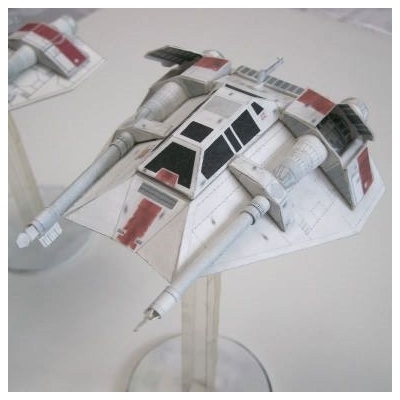 In Star Wars: Episode VI – Return of the Jedi, General Han Solo uses a stolen Imperial shuttle to land a strike team on the forest moon of Endor. The name of the shuttle is the Tydirium. 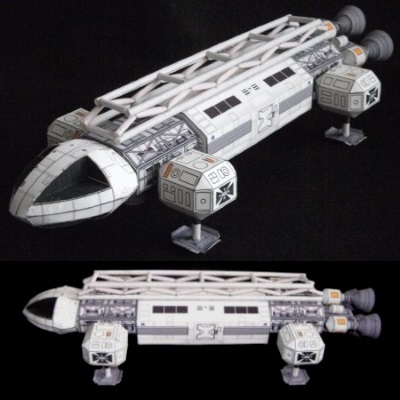 This 1:100 scale paper model of the Tydirium was created by Artur Rozek. 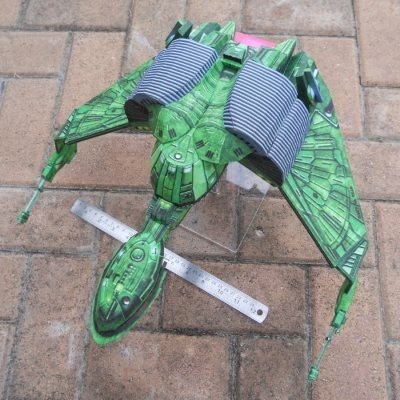 A free download of the printable template for the model may be found here. 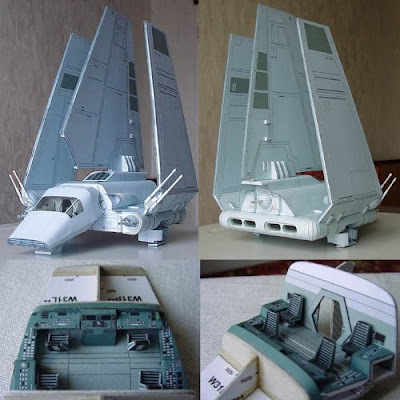 The technical name for Imperial shuttles of this type is "Lambda-class T-4a". 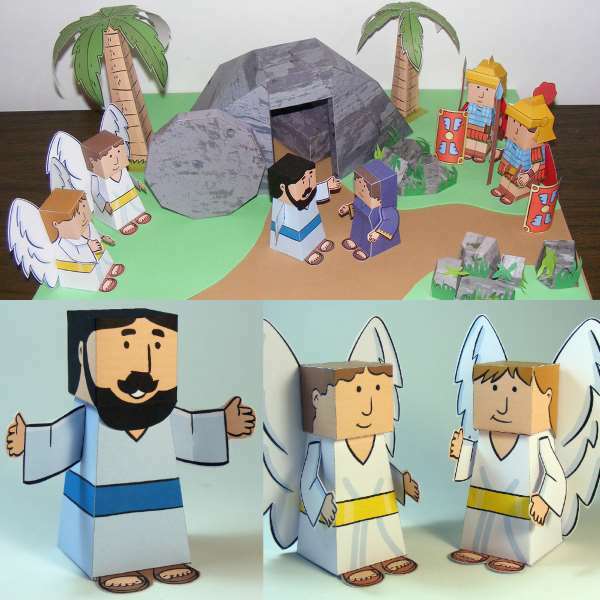 The My Little House website produces a variety of paper models based on stories in the Bible. An appropriate model to build this time of year is their diorama of the Easter story. The diorama includes the risen Christ, Mary Magdalene, two angels, two Roman soldiers, the empty tomb, plus a variety of rocks and trees. 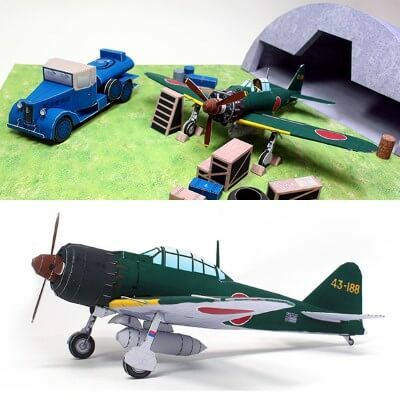 A free printable PDF template for the diorama may be downloaded here. One of the accounts of Christ's resurrection is found in the Gospel According to Luke. In Chinese mythology, the Azure Dragon (Qinglong) symbolizes the cardinal direction east. By extension, the Qinglong also represents the season of spring. 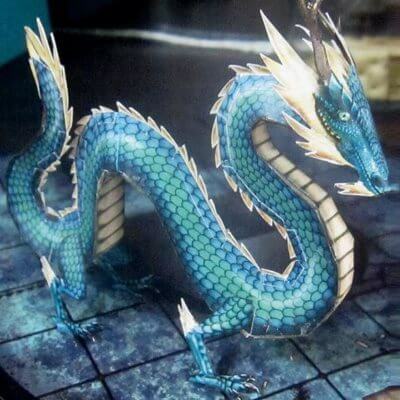 This 2.5D papercraft Azure Dragon was created for use in miniature gaming by papercraft designer, Eddnic. 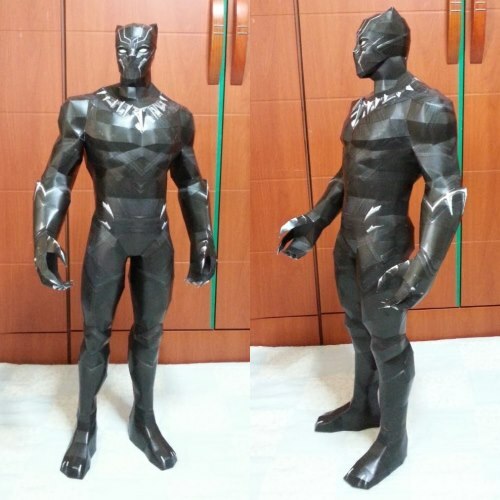 The printable PDF file for the model may be downloaded here. Sorry to say, there are no instructions for this model. Your best guide is the photo shown. 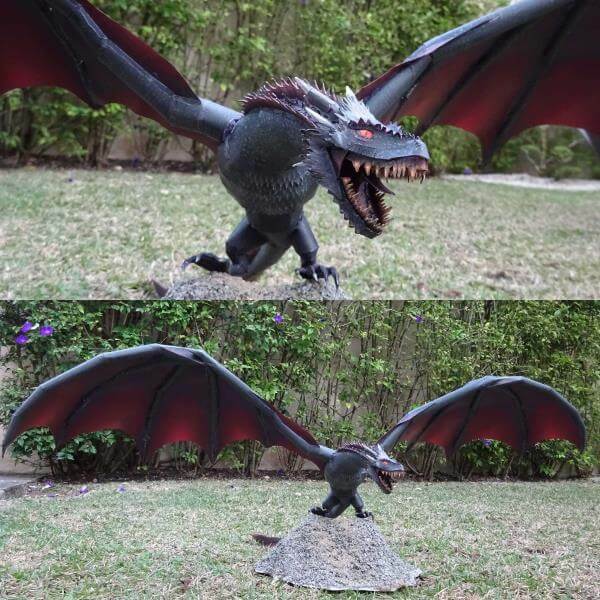 You have to be a real fan of the Minecraft video game to make one of these and keep it in your room. Too creepy for me! 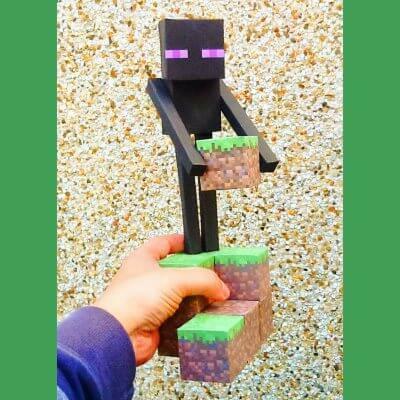 :) This Enderman papercraft was created by gamer Stephen Bear. 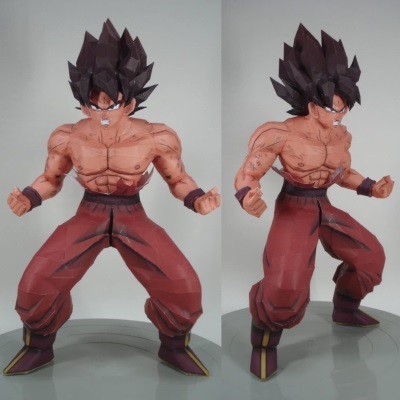 The printable template for the model may be downloaded here. In case you want to build the model as a birthday gift, included in the template is a cake block for Enderman to hold. In the game, Endermen have the ability to move blocks and can teleport. 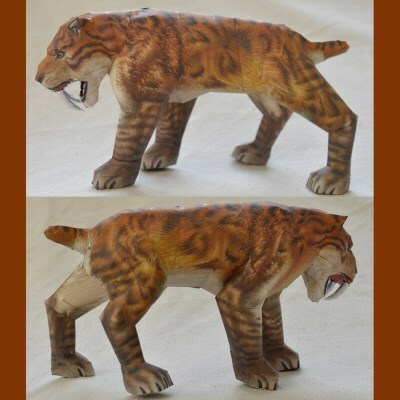 It's a papercrafter's worst nightmare: coming home to find the family pet has eaten your entire paper model collection! 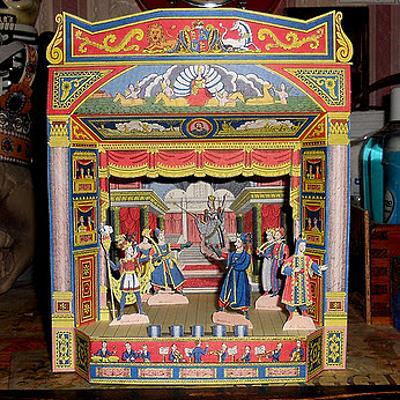 This paper automata depicting such a scene was created by Matt Bergstrom at Wurlington Press. The title of this piece is "Max's Snack Attack". 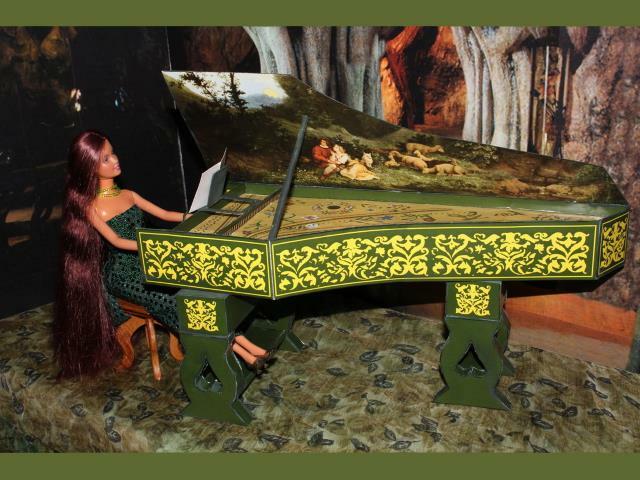 Matt created the work to commemorate the 2015 International Paper Modelers Convention in Sterling, Virginia. A PDF template for the model may be downloaded here.